This week's SHOPPING OUR STASH challenge is "Who's Who." This time around the SOS crew would like you to use a photograph or a stamped image of a person. Here's what I came up with using the "Make Your Own" stamp by Hero Arts and some retro looking design paper. I had fun with my distress markers and water brush water colouring the vintage ladies. 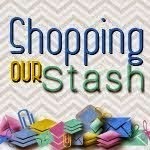 Be sure to visit the SHOPPING OUR STASH BLOG for all the details on the challenge and while you are there be sure to show the rest of the SOS crew some crafty lovin!! Wow great czsrd love that background and great retro ladies. love it. Fabby job. Love this, Donna! I thought at first glance that you paper pieced the dresses, but you water colored them! Awesome possum! I also thought "paper piecing" for the dresses until I looked more closely. Nice job!!! Wonderful retro feel card. Love the images. Thanks for joining us at Just Us Girls! Donna, I love the composition of this card. I almost feel that I could channel June Cleaver. You have amazing amount of detail work invested here! Great work and very nicely done! Great retro card! 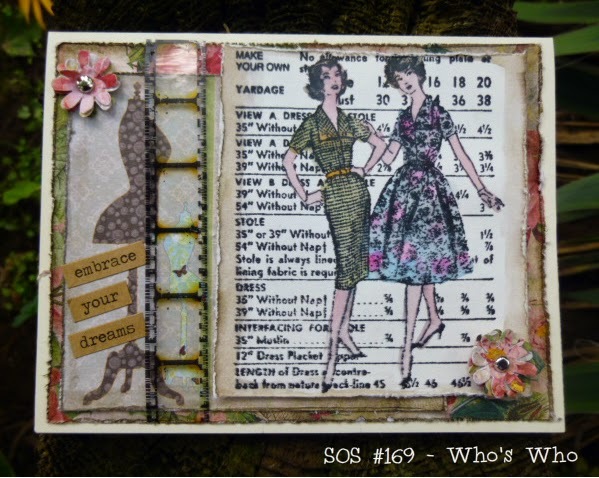 Love those vintage ladies and the addition of the film strip. Thanks for playing with us at JUGS! Fabulous water coloring! Thanks for joining in with JUGS! ERmagerd, this is awesome! The film strip, the sentiment, the distressing, the perfect watercolouring....you know it's a gateway drug to markers! mwahahaha :) JUGS would be so lucky to have you!